Kingpin Chess Magazine » That’s the Spirit! A polished pine bedroom in a convent school, Tallinn, Estonia, September 1997. A bottle of whisky, unpacked suitcases, and three drunken chess players playing blitz. Andrew Martin, Simon Williams, Jonathan Rowson. And, our invisible friend, ‘The Spirit’. It is intriguing. It is intriguing that intangible thoughts and feelings can have a causal effect on our decisions. That hunches, intuitions and obscure facial-expression altering thoughts can, to our own mind, justify the inexpressible and inexplicable. And yet the Spirit is just that. It’s just that I don’t know how to express or explain it. It must be felt to be understood; a bit like the force of The Force which may be with you, but then again may not. Anyway, the above scene depicts the eve of the first round of the European Junior where the three of us joked about the fourth. Simon was particularly inspired. Laughing, blitzing and bellowing ‘That’s the spirit’ whenever an otherwise dubious move necessitated justification on the grounds of boldness. He was particularly trigger-happy with his rook pawns which hurtled down the chess board like bowling balls on speed, hoping, hopelessly, for a strike or at least a spar. For my part I laughed along, somewhat agnostic about the whole thing but desperately wanting to be a believer. We called it a day when it was clearly no longer, and retired for the night. The next day we both lost. We couldn’t even say that we died with our boots on, for although there was ‘spirit’ in our games it was boyishly conceived and undertaken without genuine faith. The Spirit must be respected, even deified. It must not be taken for granted. It is not a substitute for good judgement and calculation. It is manifested as an understanding of the potential energy of each and every piece. It rewards boldness but not casual risk. It is not blind faith in the authority of attack over defence. It does respond to confidence and delights in creativity but it allows no room for complacency and demands whole-hearted commitment. When undirected and ill-conceived the Spirit can be a force for harm and one must therefore be fully concentrated to be receptive to it. The following day Simon gave a model performance, showing how the Spirit can be harnessed to devastating effect. 1 c4 e5 2 Nc3 Nc6 3 Nf3 f5 4 d4 e4 5 Ng5 Be7 6 h4 Bf6?! This looks like a mistake. Black probably missed 7 e3 Bxg5? 8 Qh5+. 7…Nce7 8 c5! d5 9 cxd5 cxd6 10 Bb5+! –Williams. 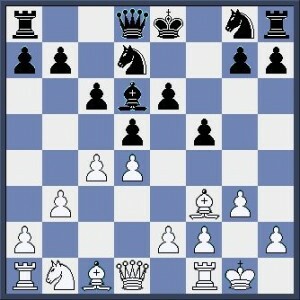 8 Nd5 Nce7 9 Qh5+! A good example of the workings of the Spirit. Many players would content themselves with 9 Nxf6+ Nxf6 10 Be2, which is the standard wife and two kids, semi-detached option, but Simon’s move shows the rabid intensity of an artist looking for truth. He wants more and dares to believe he can get it. That’s the Spirit; Carpe Diem on the chess board. 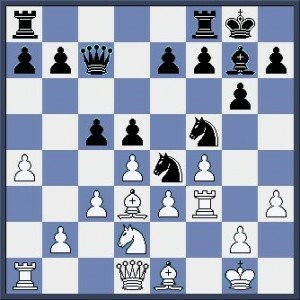 If 12…Kd7 then 13 Be2 Qg8 14 Qxh5!. 15…fxg4 16 Ng5+ Kf6 17 Nxe4+. The position has clarified and the Spirit can rest. White is strategically winning because of Black’s dark square weaknesses and king vulnerability. But note that the Spirit lives on in White’s accuracy; this is the clearest way of dealing with the destabilising threat of …g5. Although Black’s opening play presented immediate opportunity for White, the vigour with which victory was pursued leaves a stunning impression. Needless to say there was a certain amount of tension before the following game. The previous day had put us both on a high and the whisky was long since out of our system. 1 f4 g6 2 Nf3 Bg7 3 d4 c5 4 e3 d5 5 Bd3 Nh6 6 c3 0–0 7 0–0 Nd7 8 a4?! For the Spirit, this reeks of an unwanted early morning alarm call. Not only does this give back the advantage of the first move but it also lacks any concrete purpose. I guess Simon wanted to discourage …b6 and sought to answer …Nf6 with dxc5 but my reply makes a mockery of that. 8…Qc7 9 Bd2 Nf6 10 Be1 Bf5 11 Be2 Bg4?! I was already high on caffeine and conscious of potential tactical possibilities. In this sense I was trying to force the Spirit unduly. Had it not been for a desire to play a memorable game I would have played the best move, which is 11 Bxb1! 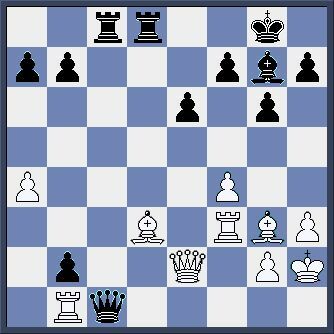 ; after 12 Rxb1 Nf5 Black has a very comfortable position. In the post-mortem Andrew Martin suggested 11…cxd4 12 cxd4 Qc2 when ‘Black will always be better’. Both players had seen this but we weren’t so sure. For one thing, Simon immediately told Andrew that it wasn’t the Spirit, and for my part I thought White had good chances of equalising after 13 Qxc2 Bxc2 14 Nc3. Simon was playing so quickly that I was sure he had not seen the following, but just because I had seen it was no reason to play it when I knew there was a good alternative in 15 Nfd6. I’m not sure if this is the Spirit or not. I think everything back there was more or less forced, or at least I thought so at the time when I assessed this resulting position as unclear, but fully in accordance with the Spirit. It is important that White cannot take on b2 here: 22 Rxb2 Bxb2 23 Qxb2 Qc1 24 Qe2 Rd1 25 Rf1 Qa1 and there’s no good answer to the threat of 26….Rcc1. 22 Bg3 Qc4 23 Bd3 Qc1+? At this crucial moment I betrayed the Spirit by being afraid of ghosts, which is somewhat ironic. I should have had the courage to play the consistent 23 Qxa4 allowing 24 f5 Qd7! when the position remains unclear but White is very much in a ‘do or die’ situation and it’s far from clear exactly how he will do. 24 Rf1 Bd4+ 25 Kh2 Qe3. Excellent! This is the spirited move I simply hadn’t seen. White promptly sacrifices lots of material but brings purpose to his pieces in doing so. Without this liberator White is simply worse but now Black is close to being lost. So, three pawns and a rook for two bishops; but Bertie and Billy are a formidable pair. This seems unavoidable; threats of Bxf5, Bg5, Be5-h6 and Bh6 are otherwise deadly. The position has changed so many times that we were both finding it hard to adjust, but with over an hour on his clock there was no reason for Simon to rush. 29 h4! is very hard to meet, because I don’t have time to meet h5 with g5; we concluded that Black could probably defend with best play but that White’s winning chances were considerable and persistent; running short of time I’d put my chances of holding at around 20%. At this stage I was struggling to maintain the impression of being in control; especially because I didn’t have time to calculate 34 Qg8+, which seems to be a razor neck draw for Black; 34…Qxg8 35 Rxe7+ Kf8 36 Bd6 Qxa2 37 Rd2+ Kf7 38 Rxa2 Rc4 and Black should draw. 34 Rg3 g5 35 Qd5 Qxa4! Better late than never; as far as I can tell, Black is okay now. 37 Qxc8 Qe6 is fully equal. In some ways I find it hard to analyse such games objectively but I have to regretfully admit that I see no continuation to White’s attack after 43…Qe6 (44 Bxh6 Qxh6!). 43 Bf4 Qe6 44 Re3 Qg6 45 Rg3 and at this point, somewhat bemused, we agreed to a draw. As the tournament progressed I steadily improved my form and became more closely acquainted with this elusive Spirit. In the early rounds I’d doubted its existence since most of my games were fairly long, technical unspirited affairs. Then, mid tournament, a group of players in our convent got round the kitchen table to play blitz doubles and hear Heather Lang’s beautiful rendition of ‘The Sound of Silence’. Something incredible happened. No consultation, and for goodness sake no analysis please; the exclams are a recognition of the Spirit. Simon and myself unashamedly asked around for a piece of paper on which to record this masterpiece, aware that the Spirit had once again given us ‘a sign’. Maybe I’m being bolshie, but this is not a bad effort for one minute on the clock. You could even say it was pure Spirit, at any rate it felt very good. I went on to win the silver medal and a few weeks later made my first GM norm. I think I was beginning to grow up but I was also refining my feeling for the Spirit, as I hope the following game shows. It was either this or 7…h5 which I felt was too one-dimensional. The idea is to play a Stonewall Dutch a few tempi up (Bg4-f3 v. Bd7-e8-h5-f3) without the problem piece. 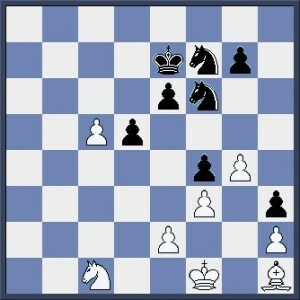 Delaying the capture on f3 allows White time to play Nbd2 and recapture with the knight. This emphasises the centrality of the battle for the e5 square which will be eternally crucial with almost any piece configuration in this structure. A good example of playing against the Spirit; the consequences often being similar to relieving yourself against the wind. The position is equal after this move and the fact that it was probably equal before it is not the point. The point is that this move has no Spirit, it breaks the inter-connecting energy in White’s position and it is inconceivable to me that any top class grandmaster would play this move, even if they were trying to simplify towards a draw. White’s main asset’s are the two bishops, the potential weakness of Black’s light squares if the position ever opens up, and the possibility of occupying e5 At a stroke these assets are thrown away and the only good news for White is that he has no weaknesses. An eventual f3-e4 break will now leave d4 weak and whilst Black can now comfortably occupy e5 twice White is unlikely to match this. A far more spirited approach would have retained more tension and confronted Black’s set up in a meaningful way. 9 b4!? and 9 g4!? have a certain appeal but are a little adolescent to cause long-term problems. 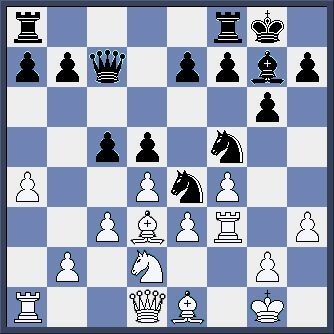 My own preference is simply 9 Nd2 intending 10 Bb2, Bg2 and Nf3 or Na3-c2-e1-d3; at any rate e4 is the big break. White should be thinking about challenging Black’s central predominance rather than tinkering around the edges with b4-b5. He should be trying to open the position gradually whilst keeping his pieces co-ordinated. The Nf7, Nf6, Qd6 configuration somehow seemed to give more breathing room than Nf6, Nd7, Qe7 and I didn’t want the White knight to stumble to its ideal square on d3 via a3 and e1. When I showed this game to Dharshan Kumaran he raised his eyebrows here and suggested that it was better to re-route the bishop beginning with 12 e3. Actually a big decision which more or less commits me to a double-edged plan. 12 0-0 is just dead equality but the ‘Spirit’ does not understand such notions. 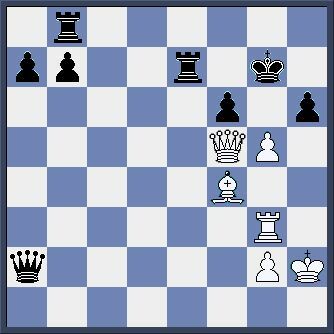 Again showing a fear of tension; 14 Rac1 is less comfortable for Black, and there is also 14 Nf3!?. I went for a walk, feeling thoroughly possessed by the Spirit, but for all my hot air the position is still equal. But now White is getting going. This move is undoubtedly spirited and now, well exercised, I sat down to gather some important thoughts … and spent about twenty minutes during which time I had seen, and had to see, the position on move 27. A chain is only as strong as its weakest link and without this move none of the previous ones would stand up. 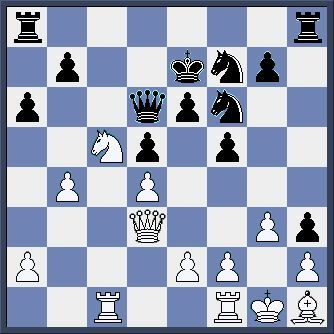 Any other move seems to give White the advantage, because the knight on c5 cannot otherwise be dislodged. After the preparatory 21 e3 I have time for 21…Rha8! 22 f3 b6 with advantage. More or less forced; 23 gxf4 Qxf4 gives Black at least a perpetual with Qg5-h4+ and a pleasant alternative in a rook lift to g5. As I said earlier, the Spirit manifests itself in the inter-connecting energy between the pieces, but I forgot to state that the pieces need the help of the pawns. 25 Qxb5!? leads to lots of scary analysis but as long as the bishop is in its strait-jacket Black cannot be worse. 25…Rha8 26 Rxa2 Rxa2 27 Qxb5 Qc7! The bishop on h1, as Pete Wells likes to say, is ‘a bit of geezer’, and this more than compensates for my temporary material deficit. 28 Rc1 Qa7 29 Kf1? A blunder, but after 29 Kf2 Ng5 intending …Qa3 or …Ra1, it’s an understatement to say that I don’t envy White’s position: he is effectively a piece down. Normally at this stage the annotator would say something about the rest being a matter of technique but somehow it didn’t seem so easy. I think there’s been enough analysis for one article so I won’t dwell on all the variations, but Black’s problem is in defending all his pawns whilst preventing the bishop from escaping. This is no simple task. …I thought for half an hour! 42…Na5+ 43 Kb4 Kb6! 44 Nc5! 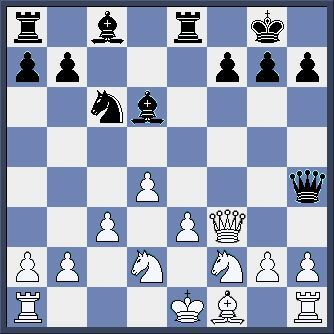 (45 Nxe5 Nc6+) and it’s not straightforward by any means. 44…Ng3 45 Nd3! 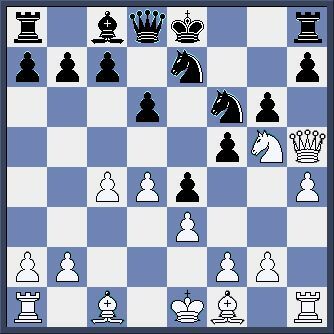 (45 Ng6 Ne6)…Nxh1 46 Nxf4 Ng3 47 Nxh3 with a probable draw. 45…Nf1 46 Nxf4 Ng3 47 Bg2!. It seems that White has made progress, but in fact his counterplay is coming to an end. And the bishop on h1 is still a bit of a geezer. Probably somewhat tired, White gives material without fully calculating the consequences. That said, I guess the slogan ‘No bishop, no hope’ comes to mind. 55 g6 Kd6 56 Kc2 Ke7 57 Kb3 Kf6 58 Kc4 Kxg6 59 Kd5 Kf5 60 Ne1 g6! 61 Nd3 Ng5 62 Ne1 d3!. 55…Nxg5 56 Nxf4+ Ke5! 57 Nh5 g6 58 f4+ Kf5 59 Ng7+ Kxf4 60 Kd3 Ke5 and White resigned just in time for dinner. There is no meaningful conclusion to this article. I said at the outset that I couldn’t explain the Spirit and I’m sure you’ll understand that I’ve used a certain amount of artistic licence in advocating such a notion. At any rate, it’s fully conceivable that it’s all just chat, but nonetheless I hope you’ve enjoyed the games and that you may also feel the Spirit. You are here Home 2013 December That’s the Spirit!